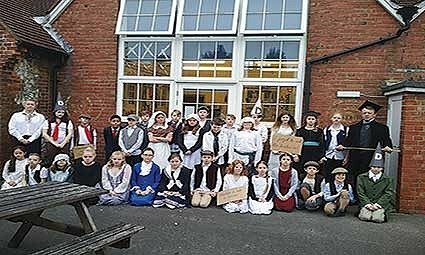 Children from Upper Beeding Primary school travelled back in time to experience what it would have been like in a Victorian classroom. It is rather fitting that pupils from Year 5 and 6 are learning about this period in time as their classrooms are accommodated in the original Victorian ‘Old Building’ of the school. Children were met by their strict Victorian teachers, who they had to address as Sir or Ma’am, on a chilly January morning and entered the building single file through separate boys and girls entrances. They quickly learnt that ‘Children should be seen and not heard’ and obeyed the School Rules of standing when an adult entered the room, only to use their right hand for writing, and under no circumstance were they allowed to ask questions. Schooling was about discipline and talking, fidgeting or poor work were all punishable with 6 good strikes of the cane! The children learned the three R’s; Reading, Writing and Arithmetic. They recited The Lord’s Prayer, undertook dictation and repeated times tables – and if they were slow or produced poor work they were given the ultimate shame of wearing the Dunce’s hat and standing in the corner!